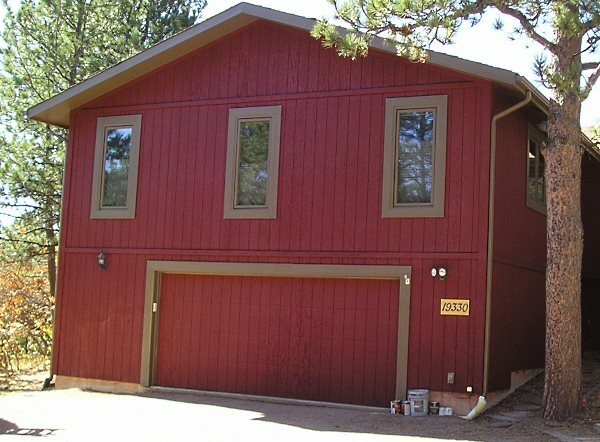 Siding and trim can be beautified and protected from the elements with exterior wood stain. An exterior stain must have the ability to resist the damaging effects of the sun and rain. Plus, provide a pleasing appearance for as long as possible. This is difficult for a product that is designed to allow the wood grain and character to show as part of the finish. Exterior wood stains can be put into two categories, semi-transparent and solid color. Each type represents different amounts of pigments. Semi transparent stain will allow the underlying wood grain to show through. These stains tend to have low amounts of pigments. Typically they have very light consistency and is applied as a thin coating. Solid color stain has more pigments than semi transparent stains. This provides the ability to cover blemishes and discoloration in the wood. A solid color stain will still show the woods texture, but less wood grain. These stains have a heavier consistency and are applied in thicker coats providing a “painted” look. An excellent choice for projects involving different types of wood or if a consistent color and appearance is desired. 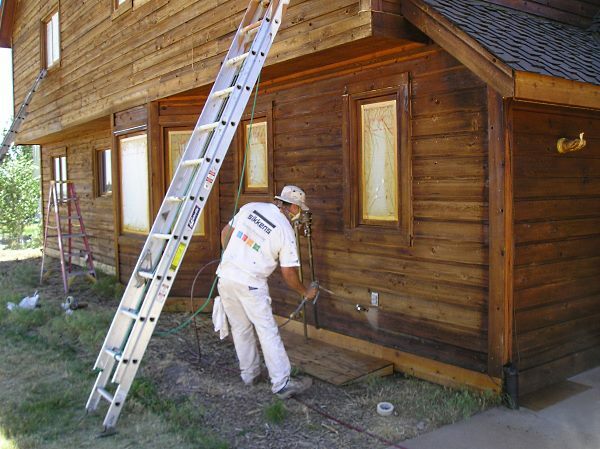 Both types of exterior wood stains are available in oil base and water base formulas. These are well suited for most uses and will provide good results with excellent water repellency. Oil based exterior stains are typically a combination of alkyd resins, linseed oil and/or tung oil. Added to theses oils are pigments and UV stabilizers for color and longevity. 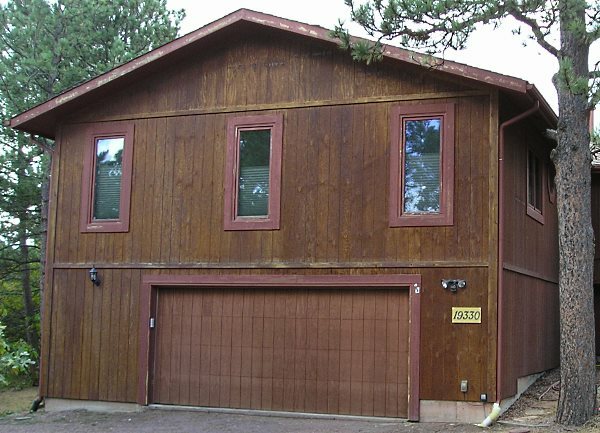 Oil based exterior wood stains have great penetrating ability. But will oxidize faster, needing restaining more often. A oil base stain offers greater penetration and easier over all maintenance. Plus, the finished look has a tendency to be more even in color and appearance. This is especially true for semi transparent stains. On the down side, these products are hazardous and flammable. They smell bad and are difficult to apply. Water based exterior stains are a combination of acrylic or latex resins, stabilizers and pigments. 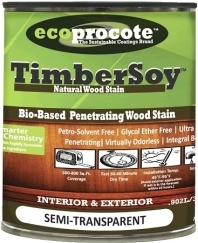 Although similar to house paint in some ways, these products are thinner allowing some penetration into the wood. Usually dries quickly forming a protective film on the surface. The water base stains offer greater longevity in most situations, but the surface preparation to re-stain is more involved. Plus, the finished look with semi-transparent stains has a tendency to be blotchy or uneven in appearance. For this reason only a solid color stain should be used. Another choice is emulsified oil plus acrylic. This is a combination of oil base and acrylic components. It sounds strange, but it does work. The benefits are better penetration than acrylic, water clean up and great stability. I have used both semi-transparent and solid versions of emulsified oil acrylic wood stain with great results. All of these exterior wood stain types can be used on any wood species and are formulated for vertical surfaces. These can include fascia boards, soffits, lap siding and T-111 siding. Horizontal surfaces, such as wood decks, should use decking stains designed for this purpose. Most woods used for siding and trim are very porous, like cedar and redwood. New ruff cut cedar will take stain very well, allowing deep penetration and an even appearance. A semi-transparent stain can be a great choice for new wood allowing the beauty to show through. But, after a few years of exposure to rain and sun, even with stain, the wood becomes rougher and more porous. Discoloration from water, tannin bleed and rust from nails will become evident after a few years. In order to apply the original lightly pigmented stain a lot of surface preparation will be needed to achieve the same new look. Using solid color stain, the volume and complexity of surface preparation can be reduced. When choosing the best exterior wood stain for your project you will need to evaluate the surface first. After a thorough pressure washing most of the loose and oxidized stain should be removed. Unfortunately, some stain will remain under the surface, but how much is remaining? Answering this question will determine which stain to use. Siding will usually come clean, but soffits rarely see the sun and weather. 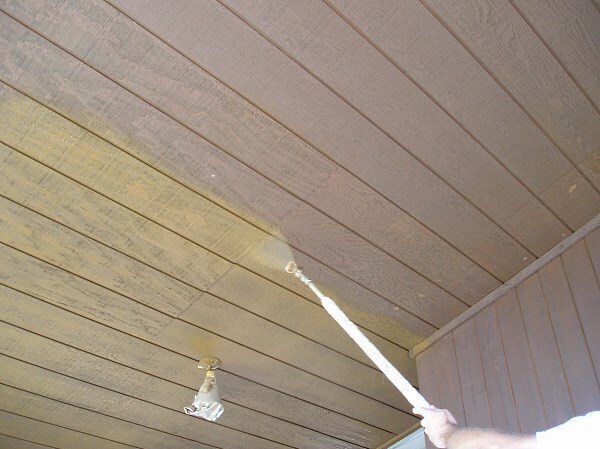 So it is possible to use virtually any exterior wood stain color on the siding, but the same color or darker exterior stain will have to be used on the soffits. 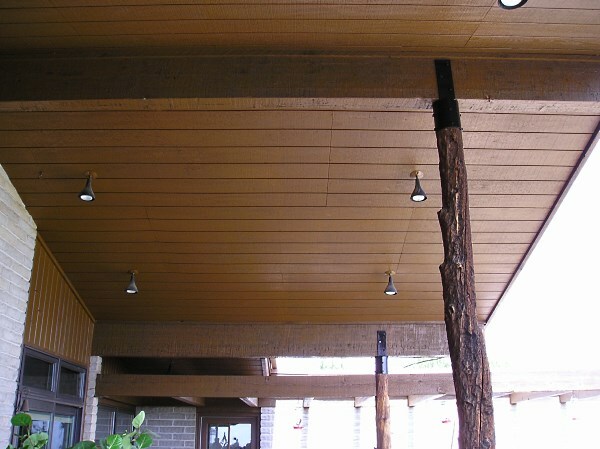 Keeping to one color for the body and soffits will make the application easier. Choosing a slightly darker color is the best compromise. Only a solid color stain can cover up the preexisting stain and offer a even look. If any sheen remains on the stained surface, only the same type of exterior wood stain can be used. This sheen is typical of oil base stains. It is my belief that oil base stains should be used over oil base stains and acrylic over acrylic. The evaluation process is very specific to each home and has to be done before the actual exterior wood stain and color can be chosen. All of these stains are available in many colors, with custom mixed colors possible. This is especially true for solid stains. Most manufactures have dozens of colors and multiple bases allowing for deep colors. The most popular colors I have used over the years are browns and reds or combinations of these. At my high altitude, in Colorado, the inclusion of brown into any color will provide more UV resistance. The most important is resist water absorption that causes warping, splitting and cracking. This is very difficult due to the porosity of the wood. Apply enough exterior wood stain to fully saturate the wood. An oil base stain will penetrate the easiest. But, an acrylic or emulsified oil acrylic wood stain will allow trapped water to escape. Prevent graying or fading due to UV light from the sun. The color will influence how long the stain can last. Try to include at least a little brown in the color to increase UV resistance. Prevent rot and be mildew resistant. Many manufactures include wood preservatives and mildewcides. Is easy to apply. Allowing additional coats in the future for lower maintenance costs.